The USGBC-Missouri Gateway Chapter, the City of St. Louis, and partners announce multiple opportunities to learn about energy benchmarking and get hands-on assistance with the free, online tool ENERGY STAR Portfolio Manager. Benchmarking is the process of tracking your building’s energy and/or water use and comparing your performance to similar buildings and to past performance. Benchmarking is the first step in determining how to conserve resources, reduce operating costs, and reduce environmental impacts. ENERGY STAR Portfolio Manager is a free and secure online tool that tracks energy and water consumption, as well as greenhouse gas emissions. Any building can use ENERGY STAR Portfolio Manager to understand their energy, water, and waste performance – schools, governments, congregations, businesses and retail stores. Stop by our office during a drop-in session to receive hands-on help with ENERGY STAR Portfolio Manager. Attendees should bring a laptop and all information needed for benchmarking (list available via event links below). This event is free, but registration is requested. Benchmarking 101 will provide an overview of the City of St. Louis’s Building Energy Awareness Ordinance with step-by-step instructions on data collection, benchmarking in ENERGY STAR Portfolio Manager, and reporting data to the City of St. Louis. Lunch is provided. This event is free, but registration is requested. This interactive event will provide real details on how to save energy in buildings. Participants will circulate between quick presentations, gaining insight into numerous energy efficiency projects and financing solutions. This event is free, but registration is requested. Efficient operations and smart maintenance in buildings not only reduce operating costs by 20-50%, but increase occupancy rates and tenant satisfaction. Taught by industry experts, the two day GPRO Operations & Maintenance Essentials Course provides building professionals with the critical tools to transition from conventional to sustainable operations. Full details and registration available via the links below. Privately owned buildings are required to benchmark and submit data by April 1 of each year using the free, online tool ENERGY STAR Portfolio Manager. Full details about the Building Energy Awareness Ordinance are available at www.stlbenchmarking.com. The Better Buildings Through Benchmarking Campaign recognizes and supports buildings of all types and sizes to benchmark their energy use, a building management best practice. Over 80 businesses, organizations and institutions have voluntarily pledged to benchmark, the first step to reduce operating costs and environmental impacts. Learn more and join the campaign at www.BetterBuildingsStl.org. All events are free, but space is limited and registration is required via the links below. Stop by our office during a drop-in session to receive hands-on help with ENERGY STAR Portfolio Manager. Attendees should bring a laptop and all information needed for benchmarking (list available via event links below). Following a brief overview of energy and water benchmarking, volunteers will provide hands-on assistance with ENERGY STAR Portfolio Manager. Attendees should bring a laptop and all information needed for benchmarking (list available via event links below). 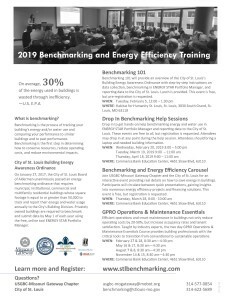 Benchmarking 101 will provide an overview of the City of St. Louis’s Building Energy Awareness Ordinance with step-by-step instructions on data collection, benchmarking in ENERGY STAR Portfolio Manager, and reporting data to the City of St. Louis. Lunch is provided. Register using the links below. The Missouri Historical Society’s energy benchmarking and energy conservation achievements were recently honored with an American Alliance of Museums Sustainability Excellence Award! Participation in the USGBC-Missouri Gateway Chapter’s voluntary energy benchmarking campaign, now Better Buildings Through Benchmarking, drove the Missouri Historical Society to pledge to reduce their energy use by 25% by 2020. 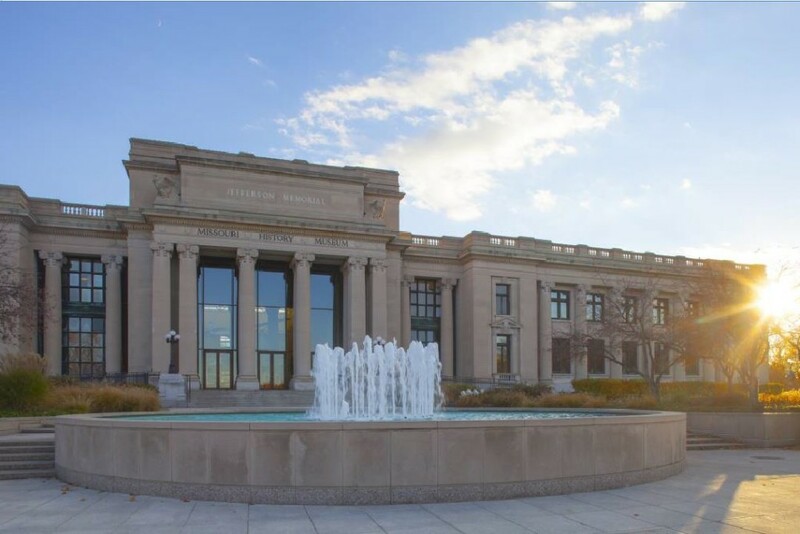 Through energy benchmarking, an energy audit, and implementation of facility improvement measures, the Missouri Historical Society has conserved energy, realized operational cost savings, and extended the life of their operational equipment. The Missouri Historical Society is a proud steward of sustainable practices in the St. Louis community. We strive to be educators at the forefront of sustainability, and we are constantly finding new ways to reduce our energy consumption and greenhouse gas emissions. In 2009, MHS took its first steps toward increased sustainability through employee and community engagement. Three years later in 2012, in partnership with the U.S. Green Building Council, Missouri Gateway Chapter, we took a pledge to reduce our energy usage by 25% by the year 2020. That pledge led MHS to take a closer look at our energy consumption and consider how we can better serve our community, our donors, and our world. We recognized that we needed to make fundamental changes to fulfill our promise, so we commissioned an energy audit of the Missouri History Museum. Its results compelled us to honor our commitment to minimize consumption of energy and materials and reduce our operational costs associated with energy usage. Read the full case study online here. Privately owned buildings are required to benchmark and submit data by April 1, 2018 using the free, online tool ENERGY STAR Portfolio Manager. 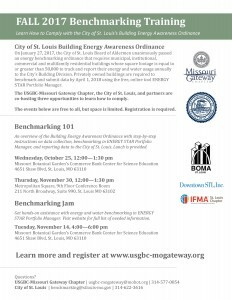 Full details about the Building Energy Awareness Ordinance are available atwww.stlbenchmarking.com. Join the USGBC-Missouri Gateway Chapter, the City of St. Louis, and partnersfor Benchmarking 101, an overview of the Building Energy Awareness Ordinance with step-by-step instructions on data collection, benchmarking in ENERGY STAR Portfolio Manager, and reporting data to the City of St. Louis. This event is free to all, and lunch will be provided. Space is limited and registration is required. In 2010, Bethel became a Green Congregation working with the national Lutherans Restoring Creation (LRC) program. Since 2013, Bethel has been working to increase their energy efficiency, reduce their carbon footprint, and save money through the LRC’s Energy Stewards initiative. As a participating congregation, they began to measure their energy use in ENERGY STAR Portfolio Manager, a free online tool that allows buildings to benchmark their energy use. Their initial results left plenty of room for improvement; they found that their baseline ENERGY STAR score was 36, well below average. 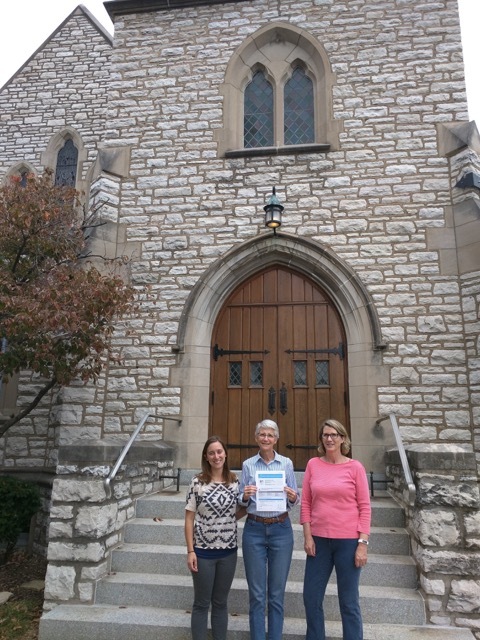 Johanna Schweiss (USGBC-MGC), Cindy Gross (Bethel Lutheran Church Green Team), and Linda Daniel (USGBC-MGC) with Bethel Lutheran Church’s final ENERGY STAR Application. 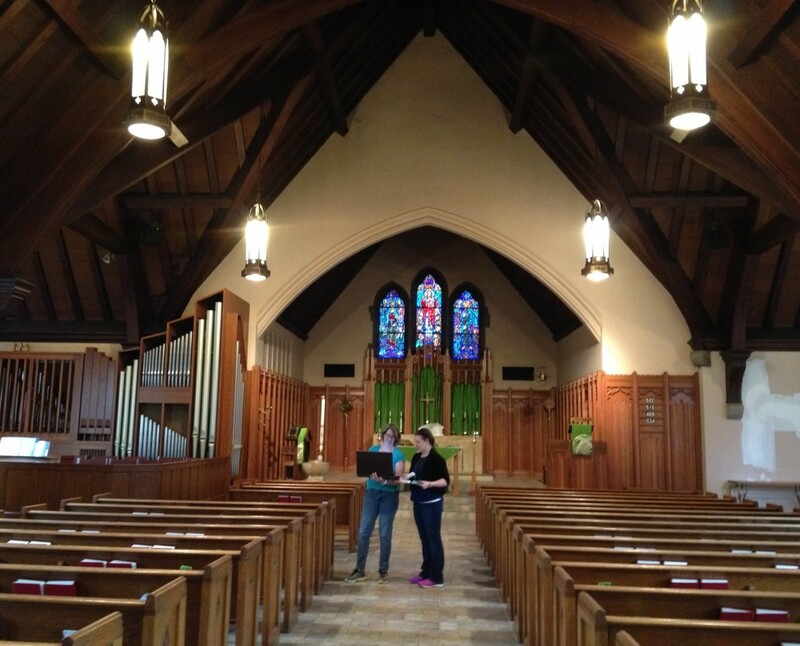 Bethel Lutheran Church conducted an energy audit in September 2013, and since that time their Board of Property and Maintenance has been working faithfully to implement big and small building improvements. These improvements include low and no cost changes such as sealing gaps around doors, as well as projects that required more investment but paid off with energy savings, including installing LED porch lights, installation of new heat pumps, furnace, and AC units, replacing windows, and transitioning to a zoned heating approach to reduce dependence on an old boiler. Bethel Lutheran installed solar panels in 2014. According to the U.S. Energy Information Administration, the energy used by buildings in the United States is responsible for almost 40% of our national greenhouse gas emissions. By reducing their energy use, Bethel Lutheran Church not only lowered their energy bills, they reduced the environmental impacts associated with energy use, thus lowering their impact on poor regional air quality and global climate change. USGBC-Missouri Gateway Chapter Volunteers Linda Daniel and Martha Martinko perform the facility walk-through required for ENERGY STAR Certification. Bethel Lutheran Church, a member church of the Evangelical Lutheran Church in America, located in University City, Missouri, is a worshipping community that has set as its mission to work toward a sustainable relationship with our earth home, to follow the non-violent witness of Jesus and work for the restoration of life for those threatened and diminished by violence, and to be in dialogue and community with many in a multi-cultural and multi-religious world, globally connected in our need and compassion. U.S. Green Building Council – Missouri Gateway Chapter (USGBC-MGC) is a 501(c)(3) nonprofit community of members, advocates, and practitioners that give voice to our commitment to improve human health, support economies, and protect the environment through green buildings. The Missouri Gateway Chapter serves the community by educating and advocating for green building principles and practices, and believes that everyone deserves access to green and healthy spaces. They run a voluntary energy benchmarking campaign which promotes the use of ENERGY STAR Portfolio Manager and ENERGY STAR Certification. Missouri Interfaith Power & Light (MO IPL) is a religious response to global warming and aims to engage, equip, and educate Missouri faith communities to be stewards of God’s creation by addressing the environmental and social justice consequences of climate change. MO IPL is one of 40 state affiliates of Interfaith Power & Light and works with congregations to model energy stewardship in their communities. There are over 14,000 congregations involved in national IPL programs. ENERGY STAR is a voluntary program of the U.S. Environmental Protection Agency (EPA) helping businesses and individuals save energy and fight climate change through superior energy efficiency. Through ENERGY STAR, the nation’s most energy efficient buildings can earn ENERGY STAR certification. Since 1999, tens of thousands of buildings and plants across America — such as schools, hospitals, skyscrapers, retails stores, and manufacturing plants — have earned EPA’s ENERGY STAR for superior energy performance. On average, ENERGY STAR certified buildings use 35 percent less energy and cause 35 percent fewer greenhouse gas emissions than similar buildings. Privately owned buildings are required to benchmark and submit data by April 1, 2018 using the free, online tool ENERGY STAR Portfolio Manager. The USGBC-Missouri Gateway Chapter, the City of St. Louis, and partners are co-hosting three opportunities to learn how to comply. The events below are free to all, but space is limited. Registration is required. An overview of the Building Energy Awareness Ordinance with step-by-step instructions on data collection, benchmarking in ENERGY STAR Portfolio Manager, and reporting data to the City of St. Louis. Lunch is provided. Get hands-on assistance with energy and water benchmarking in ENERGY STAR Portfolio Manager. Visit event page for full list of needed information.